Good Morning, this is Capital Essence’s Market Outlook (the technical analysis of financial markets) for Thursday August 16, 2018. 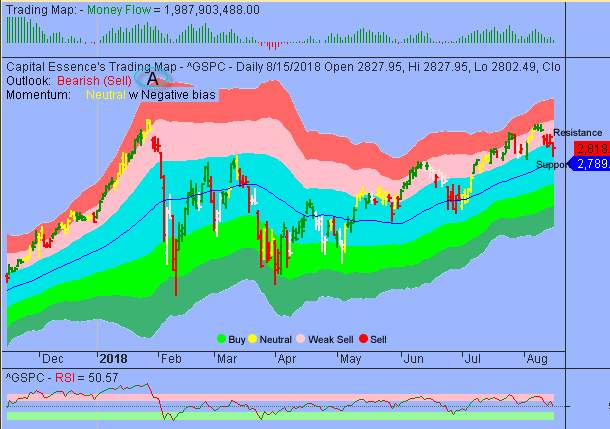 We’ve noted in the previous Market Outlook that: “market is in holding pattern as traders are watching to see whether or not the S&P can hold above the lower boundary of the pink band. Money Flow measure had been deteriorated, suggesting that the support might not hold for long. A failure to hold above key price level means that long-term buying pressure has finally been exhausted. On balance, we remain near term negative for S&P as we believe market vulnerable to some downside retracement over the short-to-intermediate term.” As anticipated, stocks sold off sharply in early Wednesday session as declines in tech shares and Macy’s dampened investor sentiment. For the day, the S&P declined 0.8 percent to 2,818.37. The Dow Jones Industrial Average dropped 0.54 percent to 25,162.41. The Nasdaq Composite pulled back 1.2 percent to close at 7,774.12. The CBOE Volatility Index (VIX), widely considered the best gauge of fear in the market, jumped about 10 percent to 14.64. Tech stocks got hit hard Wednesday as a disappointing quarterly report from Chinese tech giant Tencent weighed. Tencent’s U.S.-listed shares dropped 6.7 percent after reporting its slowest revenue growth rate since 2015. Other Chinese tech stocks like Alibaba and JD.com also fell. After a strong run of outperformance in 2017 that saw the Invesco China Technology ETF (CQQQ) soared more than 70 percent, the ETF fell more than 23 percent YTD while the S&P rose more than 5 percent. Now the question is whether recent selloff is a pause that refreshes or it’s a beginning of something worse? Below is an update look at a trade in CQQQ. Our “U.S. Market Trading Map” painted CQQQ bars in red (sell) – see area ‘A’ in the chart. The first dominant feature on the chart is the rising trend line starting in 2015. The second dominant feature of the chart is the downward trend since late 2017. This week’s massive selloff pushed the ETF below the 4-year moving average, a key support level. This is a bearish development. Over the next few weeks, traders should monitor the retreat and rebound behavior as the 50% Fibonacci retracement, around 46, is tested as support. A close below that level has measured move to around 41, or the 61.8% Fibonacci retracement. 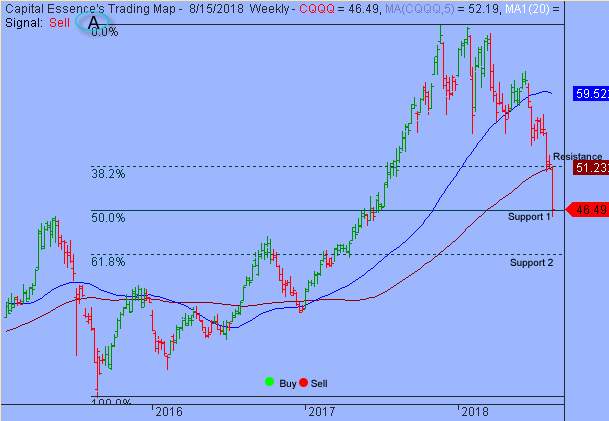 CQQQ has resistance near 51. Short-term traders could use that level as the logical level to measure risk against. Short-term technical outlook remains bearish. Last changed August 10, 2018 from bullish (see area ‘A’ in the chart). Once again, the S&P moved down to test support at the important sentiment 2800 mark after falling below the lower boundary of the pink band in early Wednesday session. Momentum indicator shifted lower from near overbought zone, indicating an internal weakness. Adding to concerns is the lagging Money Flow measure. The indicator measure flashed a weak bearish signal as it diverged from price action over the past months. The S&P took out the July high while the indicator set a lower low. This negative divergence suggested that the bears are more aggressive as prices off than the bulls were as prices ascended. Nonetheless, support is strong between 2800 and 2790 so downside risk could be limited. Short-term trading range: 2789 to 2828. S&P has a strong band of support between 2800 and 2789, based on the trend channel moving average. A close below that level has measured move to around 2740. The index has resistance near 2828. A close above that level will trigger acceleration toward the early August high near 2863. Long-term trading range: 2690 to 2880. S&P has long-term support near 2690. A close below that level will trigger a major sell signal with a downside target near 2580. The index has resistance near 2880. In summary, market internals deteriorated as S&P’s testing key support. S&P will have a downward bias this week, pressured by short-term negative momentum but we expect support to remain largely intact.